Background: Successful management of dental fear in children prevents its progression into adulthood. This study aimed to assess the level of dental fear among school children and to determine its relationship with dental caries. The study design was a cross-sectional analytical study. Materials and Methods: A sample of 1,546 primary school children were randomly selected. The Children's Fear Survey Schedule–Dental Subscale (CFSS-DS) was completed in class to assess child dental fear. Caries experience was measured as decayed, missed, and filled permanent and primary teeth (DMFT/dmft) according to the World Health Organization (WHO) criteria. Results: Approximately 24% of the participated children had high dental fear, and 12.50% of them had severe dental fear. Girls had higher rate of severe dental fear than boys (20% vs. 5%). The severity of caries was significantly increased in children who had higher fear scores (P = 0.035). Conclusion: About one quarter of 6- to 12-year-old children had dental fear; about half of them had severe dental fear. Dental fear has a direct relationship with decayed permanent teeth and an inverse relationship with restored permanent teeth. The establishment of a dental home early in life would prevent the development of dental caries and oral health problems. Dental fear may lead to lack of child cooperation, and therefore poor oral health. If dental anxiety was identified and managed successfully during childhood, this could prevent the progression of dental fear into adulthood. A dentist could recognize the different aspects of dental fear in each child and therefore guide his or her behavior accordingly, using the Arabic version of Children's Fear Survey Schedule–Dental Subscale (CFSS-DS). Recently, multiple studies,,, have been conducted worldwide to measure the prevalence of dental fear across diverse cultures. In fact, the prevalence rate estimates of child dental fear ranges from 5.7% to 46.8% in different populations.,,,, This diversity in the prevalence rates is due to the variety of the methods used in calculation, in addition to the complexity of the interplay of various factors affecting anxiety as well as the influence of the surrounding environmental factors and the variety of cultural variables among the populations surveyed. The relationship between dental caries and dental fear is controversial. Some studies found that dental fear was directly proportional with dental caries; children with high caries were reported to be more fearful than those without any past caries experience., One study did not find any correlation between children's dental fear with their carious teeth. Further investigations are needed to resolve this controversy. The aim of this study was to detect the prevalence of dental fear among primary school children and test its relationship with dental caries experience. This is a cross-sectional, analytical study and the guidelines of Strengthening the Reporting of Observational Studies in Epidemiology (STROBE) were followed in reporting this study. A sample of 1,525 primary school children participated in this study. A total of 198,405 students enrolled in 624 primary schools: 278 schools for boys and 346 schools for girls. Based on different findings among various populations,, it was hypothesized that dental fear prevalence in target population was 20%. Thus, to calculate the exact size of the sample, the percentage of the result was determined to be 20% with ±2% confidence boundaries. The level of confidence was settled to be at 95%, the significance degree was at 0.05, and the power was at 85%. The sample selection applied the multistage stratified random method recruiting the needed number of students for each gender, in both private and public schools, to represent the listed student's ratio in each district. The sampling procedure yielded 19 primary schools: ten private (five boys' and five girls') schools and nine public (five boys' and four girls') schools representative of the total number of schools. Finally, random selection of a class in each grade was done; whenever fewer than 15 students in a class were present, a second class had to be chosen. The criteria for including children were set to be 6- to 12-year-old children and attending public or private primary schools from first to sixth grade; parents should have agreed and signed the informed consent; and their native language should be Arabic. This study was granted the ethical approvals from the Research Ethics Committee in the Faculty of Dentistry in King Abdulaziz University (number 024-13). In addition, approvals from the Ministry of National Education as well as the schools were obtained. This study took place from September 2016 to April 2017. It contained various variables that were assessed by two questionnaires. The first was for the parents to complete, while the second questionnaire was the validated Arabic version of CFSS-DS,, that was completed by the participating children, to measure their dental fear level and prevalence. The Arabic version of the CFSS-DS, which has been approved to be valid both clinically and in school children,,, was used in this study for measuring children's dental fear. It contains 15 queries on various dental treatment situations (such as “opening the mouth,” “dentist drilling”). Answers had a 5-point Likert-type scale (1 = not afraid at all to 5 = very afraid). Achievable ratings lie between the scores of 15 and 75; greater values represented more dental fear. Parents' questionnaire was in Arabic, which included a letter explaining the study objectives and a parental consent for the participation of their child. It was composed of two sections: the first section was about the child's personal and socio-economic data, and the second section was made of questions with multiple choices asking about child's medical history and previous experiences at the dentist. Multiple school visits were done to acquire the school's administrative permit, to administer first the parent's questionnaire, and then to distribute the Arabic CFSS-DS (only to those with an approved parental consent), which they completed in class. A trained investigator provided instructions for completing it by reading it aloud. Individual explanation was done to students from first to third grade, when in need. Working in groups or sharing the answers was not allowed. The group of children, with no parental consent, were taken to a separate class, then were given oral hygiene instructions and activity booklets. Dental examination for children was done by two calibrated examiners (Kappa = 0.80) to correlate dental caries and children's dental fear. Two indices were used to assess the child's caries experience: decayed, missed, and filled teeth (dmft) for primary teeth, and DMFT for permanent teeth based on World Health Organization (WHO) criteria. Dental caries was recorded using community periodontal index (CPI) probe (Nordent, Elk Grove Village, IL, USA) and a flat surface mouth mirror and adequate light with proper infection control measures. Children were seated in their classrooms on a chair with high back rest. Teeth were recorded as sound if they were non-carious, untreated, or if they had discolored pits and fissures without cavitation or softening in the floors and walls. Decayed teeth had a cavity, undermined enamel or softening in floor or walls, temporary restoration, or a filled tooth with decay. Teeth were recorded as missing only if they were extracted due to caries. Finally, a confidential dental report was sent with every child to his or her parents, containing the condition of his or her teeth based on the dental examination and what was needed to be done to improve and/or maintain this dental condition. Each received questionnaire was revised if completed thoroughly. The Statistical Package for Social Sciences version 18 (SPSS, Inc., Chicago, IL, USA) was used for statistical analysis. The level of significance was P < 0.05. For every individual, the total fear score was calculated; the scores of the 15 items of CFSS-DS were added to obtain the total fear score, which ranged from a minimum of 15 and a maximum of 75. According to the dental fear cutoff score of 32, children were divided into low (CFSS-DS < 32) and high fear (CFSS-DS ≥32). The latter were divided according to the cutoff score of 38 into moderate fear (≥32 to <38) and severe fear (≥38).,, Data were presented as percentages according to the level of fear. In this study, the WHO categorization of caries levels was modified to the following: DMFT/dmft scores of zero was considered as no caries, less than 2.7 as low caries, 2.7 to 4.4 as moderate caries, and 4.5 and more as high caries. Analysis of variance (ANOVA) test was implemented to test the association between fear scores and caries experience using DMFT/dmft; when significant difference was found, post hoc test was used to determine significant intergroup mean differences. In addition, t test was used to compare mean total fear scores per gender. Chi-square test was used to compare the percentages of children with differences in fear levels according to age and gender. Two thousand questionnaires were distributed to children, of which 1,670 were returned. Fifty-three children were excluded either because they refused to be examined, because their parents did not approve of their participation, or in case of any incomplete questionnaire, and 71 children did not attend school at the day of examination, yielding a total of 1,546 participants (748 girls and 798 boys), resulting in 84% response rate [Figure 1]. 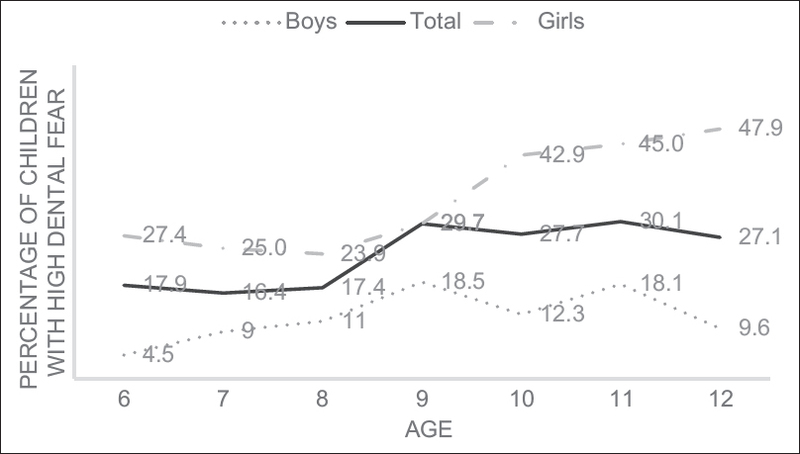 The participated children had a mean age of 9.26 ± 1.83 years; 51.62% of them were boys, with a mean age of 9.33 ± 1.82 years, while 48.38% of them were girls, with a mean age of 9.19 ± 1.83 years, with no significant difference in age (P = 0.125). The included children consisted of various Arabic nationalities: 74.45% Saudi Arabian, 13.91% Yemeni, 3.23% Palestinian, 2.47% Syrian, 1.81% Egyptian, 1.81% Jordanian, and 0.45% other Arabic nationalities such as Lebanese or Moroccan. Upon asking parents how often their participated child went to the dentist, it was found that the number of children who did not have previous dental experience was 326 (21.09%). The mean total fear score of all the participated children was 26.09 (±10.70). Girls had a significant higher mean total fear score (29.50 ± 12.34) compared with boys (22.89 ± 7.61, P < 0.001). The most fearful items among all participating children were “injections,” “dentist drilling,” and “choking”; girls' fear was higher than boys' in most of the scale items. Results showed that 23.50% of the participated children had high dental fear, that is, CFSS-DS score ≥32; specifically, 12.50% of them had severe dental fear, i.e., CFSS-DS score >38. Dental fear levels based on gender is shown in [Table 1]. Of the girls, 35.00% had dental fear, 20.60% of them had severe dental fear, whereas of the boys, 12.80% had dental fear, and only 5.00% had severe dental fear [Table 1]. The rate of dental fear based on age is shown in [Figure 2]. The percentage of children with high dental fear (fear score ≥32) level ranged between 16.4% and 30.1%, it was the highest in age 11 years for the total sample, while in girls, the highest rate of fear was at age 12 years. The percentage of girls with high dental fear was significantly greater than that for boys at all ages (P > 0.005). Caries experience was measured by two indices: DMFT for permanent teeth, and dmft for primary teeth [Table 2]. Almost half (46.77%) of the children had “high caries” in primary teeth, the less frequent percentages were given to “no caries”, “low caries”, or “moderate caries”. Mean total fear scores were variable with no statistical difference among the groups in primary teeth. On the contrary, almost half of the children (48.20%) had “no caries” in permanent teeth, the less frequent percentages were given to “low caries” and “moderate caries,” and only 4.03% of teeth had “high caries.” The severity of caries in permanent teeth was significantly increased in children who had higher mean total fear scores (P = 0.035); post hoc test did not show any significant differences. According to individual ages from 6 to 12 years, mean fear scores against dmft and DMFT as well as total decayed teeth showed no significant difference (P > 0.05). 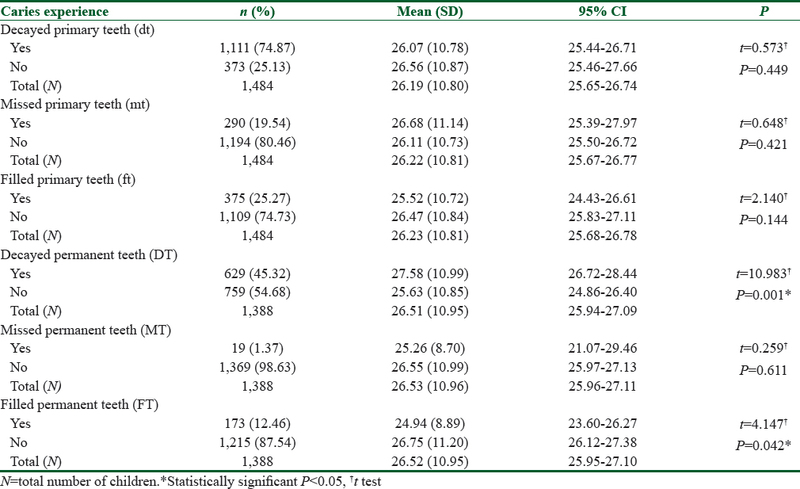 Regarding the individual component parts of DMFT/dmft, the mean total fear scores of children who had untreated decayed permanent teeth was significantly higher than other children (P = 0.001), while those who had filled permanent teeth had significantly lower fear scores than those who did not have filled permanent teeth (P = 0.042) [Table 3]. However, missed permanent teeth as well as decayed, missed, or filled primary teeth had insignificant relation to dental fear. Two thousand parents' questionnaires were distributed to the school children, of which 1,670 (84%) were returned. This was higher than other studies with a 61% response rate or 44% for mothers and 48.5% for fathers. The mean total fear score for children was 26.09 (±10.70), which was in line with the data provided by previous studies ranging from 21.0 to 37.0.,, It was higher than some studies,,,, and lower than other studies., This wide range (21.0–37.0) could be caused by the cultural differences, such as the lack of oral health services as seen in India or Bosnia, where children are brought to the dentist when they are in need of aggressive treatment or in urgent situations, rather than for the prevention of caries. The fear score in this study was higher (26.09 ± 10.70) than that obtained in the clinical-based studies (23.0 ± 7.75) in the same community;, this difference may be due to the presence of dental refrainers who do not visit dental clinics because of their dental fear, but usually attend schools. The dental fear level in school children aged 6 to 12 years was 23.50%; only 12.50% of the participants had severe dental fear. This finding is similar with other studies;, it is higher than one study and lower than others.,, The wide range of dental fear rates may be attributed to the different methods for measuring dental fear and differences in age ranges used in numerous studies.,,,,, Some studies implemented the parent-reported questionnaires, while other studies used the child self-reported questionnaires.,,,, The variation in dental fear rates resulted from the influence of social factors between surveyed children participating in each study, and the surrounding environmental factors such as various cultures in different countries., In developed Western countries with low prevalence of fear such as Denmark (5.7%), the increased use of dental services and the early introduction of preventive programs for children lead to a decrease in their dental fear. On the contrary, in Asian-developing countries with high fear prevalence such as Iran (29.3%) and India (46.88%), where there is a lower use of health care promotions and programs, children usually visit the dentist only on pain; this causes higher dental fear in the subsequent visits. This study found that girls demonstrated significantly higher mean total CFSS-DS scores (29.5 ± 12.34) than boys (22.89 ± 7.61). This finding agrees with studies that found that girls had higher dental fear than boys.,, On the contrary, some researchers found that gender had no effect on dental fear.,,,,,, The finding related to gender in this study could be explained by a cultural point of view; boys in Arabic communities are usually raised to be brave as men and are not expected to declare their fears like girls. Dental fear rates increase with the increase in age of children from 6 to 12 years in general. This finding is in accordance with some previous studies., Other studies either found insignificant correlations between age and dental fear,,,, or found that fear decreases as age increases up till the age of 12 years,, or up till the age of 14 years. This reflects the immature psychological development that increases with age; therefore, they seem to have lower levels of dental fear than older ages. On the contrary, the older the child is, the more he or she will probably be aware of his or her dental condition and will have a greater understanding of the surrounding world, which may result in higher dental anxiety. Fear scores were directly proportional with the severity of caries experience in permanent teeth. This was suggested to have a connection with both the oral health behavior (such as cariogenic diet or neglecting dental hygiene habits) and the attitudes of anxious children (such as avoiding dental treatment); moving from primary to permanent dentition, these have substantially worsened over time. This finding is in agreement with previous studies., It is contrary to another study which found that the relation between caries and dental fear was insignificant. Fear scores of children with untreated decayed permanent teeth were significantly higher than other children. Conversely, those with filled permanent teeth had significantly lower fear scores than those who lack fillings. This is supported by a previous study, which showed that untreated caries was associated with higher dental fear in children. Children's fear of unknown is a major cause of dental fear before treatment; while after experiencing dental restorations, they should have realized that it is a painless procedure that should not provoke fear. On the contrary, children's fear scores showed no significant relationship with caries experience in primary teeth. This was in agreement with the findings of few studies., However, other studies reported a significant relationship between fear and caries in the primary teeth., Perhaps this finding has a relation to the inclusion of a greater number of children in this study, as well as the younger age that either had unspecific fear or had never experienced any dental procedures. This study has a few limitations: The younger age group of children had the most difficulty in completing the self-reported CFSS-DS questionnaires; therefore, the questionnaire was read aloud in the class and a trained investigator was there to answer their questions. Also, dental fear score may be affected by children who did not visit the dentist before and who may not be familiar with some items of the questionnaire, such as “dentist drilling,” although the investigator described it to them as a whistling noise. Allowing the children to complete the CFSS-DS in the class is considered a strong point, as the data source was known and standardized, which in turn provides higher reliability and validity compared with other studies, in which the children are given the questionnaire to be taken home, where it may be completed with the parents' assistance, by their parents solely, or anyone else, leading to inaccurate fear assessment. It is recommended to constantly monitor and guide child behavior based on dental fear, to avoid its progression into adulthood. Also, both caries risk assessment and preventive dental visits are very essential to minimize dental problems from worsening, leading to worse oral health and its consequences on dental fear. About one quarter of the primary school children have dental fear and one eighth of them have severe dental fear that requires special attention. Untreated decayed permanent teeth have a direct relationship with dental fear, while restoration of caries has an inverse relationship with dental fear. No relation was found between caries experience in primary teeth and dental fear. We would like to thank Mohammed Abdullatif Alsadat for editing. El-Housseiny AA, Alamoudi NM, Farsi NM, El Derwi DA. Characteristics of dental fear among Arabic-speaking children: A descriptive study. BMC Oral Health 2014;14:118-25. Nakai Y, Hirakawa T, Milgrom P, Coolidge T, Heima M, Mori Y, et al. The Children's Fear Survey Schedule-Dental Subscale in Japan. Community Dent Oral Epidemiol 2005;33:196-204. Lee CY, Chang YY, Huang ST. The clinically related predictors of dental fear in Taiwanese children. Int J Paediatr Dent 2008;18:415-22. Rantavuori K, Tolvanen M, Hausen H, Lahti S, Seppa L. Factors associated with different measures of dental fear among children at different ages. J Dent Child 2009;76:13-9. Nicolas E, Bessadet M, Collado V, Carrasco P, Rogerleroi V, Hennequin M. Factors affecting dental fear in French children aged 5-12 years. Int J Paediatr Dent 2010;20:366-73. Akbay Oba A, Dulgergil CT, Sonmez IS. Prevalence of dental anxiety in 7- to 11-year-old children and its relationship to dental caries. Med Princ Pract 2009;18:453-7. Paryab M, Hosseinbor M. Dental anxiety and behavioral problems: A study of prevalence and related factors among a group of Iranian children aged 6-12. J Indian Soc Pedod Prev Dent 2013;31:82-6. Wogelius P, Poulsen S, Sorensen HT. Prevalence of dental anxiety and behavior management problems among six to eight years old Danish children. Acta Odontol Scand 2003;61:178-83. Armfield JM. How do we measure dental fear and what are we measuring anyway? Oral Health Prev Dent 2010;8:107-15. Olak J, Saag M, Honkala S, Nommela R, Runnel R, Honkala E, et al. Children's dental fear in relation to dental health and parental dental fear. Stomatologija 2013;15:26-31. Klinberg G. Dental anxiety and behaviour management problems in paediatric dentistry—A review of background factors and diagnostics. Eur Arch Paediatr Dent 2008;9(Suppl 1):11-5.
ten Berg M. Dental fear in children: Clinical consequences. Suggested behaviour management strategies in treating children with dental fear. Eur Arch Paediatr Dent 2008;9(Suppl 1):41-6. Bouchard GA, Brasili DS, Carlson DA, Varadharajan A. Random number generator. Google Patents; 2005. El-Housseiny AA, Farsi N, Alamoudi N, Bagher S, El Derwi D. Assessment for the children's fear survey schedule-dental subscale. J Clin Pediatr Dent 2014;39:40-6. El-Housseiny AA, Alsadat FA, Alamoudi NM, El Derwi DA, Farsi NM, Attar MH, et al. Reliability and validity of the Children's Fear Survey Schedule-Dental Subscale for Arabic-speaking children: A cross-sectional study. BMC Oral Health 2016;16:49. World Health Organization. Oral health surveys: Basic methods. Geneva: World Health Organization;2013;43-7, 74. Krikken JB, van Wijk AJ, ten Cate JM, Veerkamp JS. Measuring dental fear using the CFSS-DS. Do children and parents agree? Int J Paediatr Dent 2013;23:94-100. Bajric E, Kobaslija S, Juric H. Reliability and validity of Dental Subscale of the Children's Fear Survey Schedule (CFSS-DS) in children in Bosnia and Herzegovina. Bosn J Basic Med Sci 2011;11:214-8. Majstorovic M, Morse DE, Do D, Lim L, Herman NG, Moursi AM. Indicators of dental anxiety in children just prior to treatment. J Clin Pediatr Dent 2014;39:12-7. Nuttall NM, Gilbert A, Morris J. Children's dental anxiety in the United Kingdom in 2003. J Dent Child 2008;36:857-60. Crego A, Carrillo-Diaz M, Armfield JM, Romero M. Applying the cognitive vulnerability model to the analysis of cognitive and family influences on children's dental fear. Eur J Oral Sci 2013;121:194-203. Raj S, Agarwal M, Aradhya K, Konde S, Nagakishore V. Evaluation of dental fear in children during dental visit using Children's Fear Survey Schedule-Dental Subscale. Int J Clin Pediatr Dent 2013;6:12-5. Arapostathis KN, Coolidge T, Emmanouil D, Kotsanos N. Reliability and validity of the Greek version of the Children's Fear Survey Schedule-Dental Subscale. Int J Paediatr Dent 2008;18:374-9. Singh P, Pandey RK, Nagar A, Dutt K. Reliability and factor analysis of Children's Fear Survey Schedule-Dental Subscale in Indian subjects. J Indian Soc Pedod Prev Dent 2010;28:151-5. Panda A, Garg I, Bhobe AP. Children's perspective on the dentist's attire. Int J Paediatr Dent 2014;24:98-103. Caprioglio A, Mariani L, Tettamanti L. A pilot study about emotional experiences by using CFSS-DS in young patients. Eur J Paediatr Dent 2009;10:121-4. Colares V, Franca C, Ferreira A, Amorim Filho HA, Oliveira MC. Dental anxiety and dental pain in 5- to 12-year-old children in Recife, Brazil. Eur Arch Paediatr Dent 2013;14:15-9. Kruger E, Thomson WM, Poulton R, Davies S, Brown RH, Silva PA. Dental caries and changes in dental anxiety in late adolescence. Community Dent Oral Epidemiol 1998;26:355-9. Karjalainen S, Olak J, Saderling E, Pienihakkinen K, Simell O. Frequent exposure to invasive medical care in early childhood and operative dental treatment associated with dental apprehension of children at 9 years of age. Eur J Paediatr Dent 2003;4:186-90.